My heart breaks tonight. Dear Mollie Kitty, kitty of my heart and my constant companion for these past nearly 16 years passed away in my arms tonight. What a gift she was in my life. Though she really started out as a gift for my daughter on her birthday in the year 2000 from her then boyfriend. We had lost our two kitties in our house fire, and Jessie's boyfriend wanted to get her a new kitty. We tried hard to get Mollie to bond with Jessie. Had her sleep in Jessie's room, Jessie fed and watered her, cleaned the kitty box, gave her treats (or attempted to at least!) But from that first day (you can see her struggling to get away from Jesse in this photo), Mollie instead chose me right from the start. And me, I think I fell in love with her right away too. We have joked for years that she was Jessie's best birthday present that I ever got. So many tales to tell of her life with us. Mollie seemed to know just what we would think was cute. 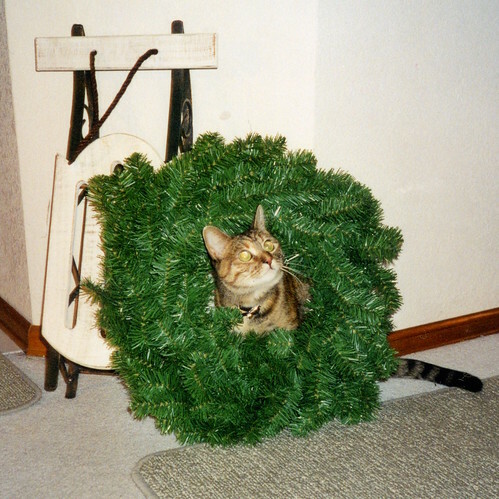 While gathering Christmas decorations to put away on her first Christmas, we found her posing with the wreath! She loved sitting any any box or basket that was available! 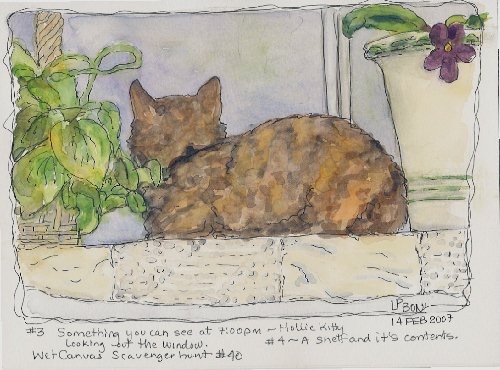 Mollie loved to sit amongst the plants and look out the window. Sometimes, she helped me keep the plants pruned - although from my perspective, they usually didn't need it! 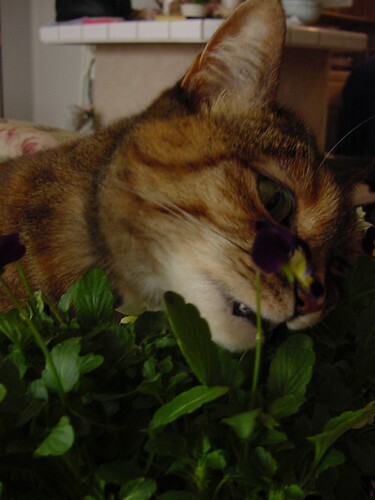 She was very fond of pansies, shamrocks and angel vine! 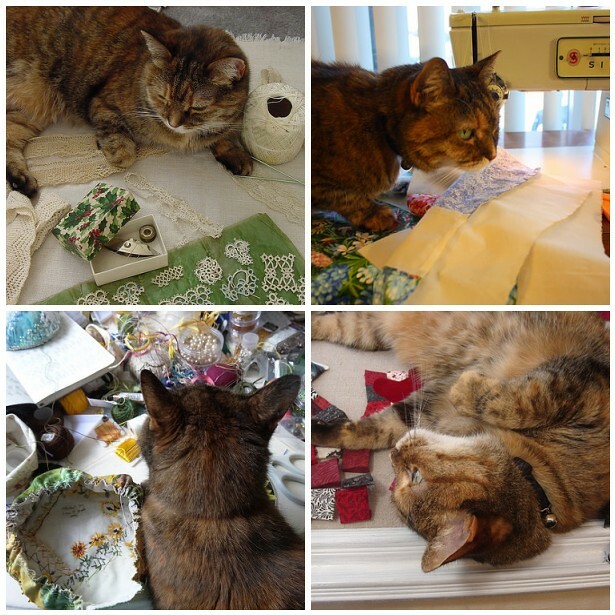 If I was sewing, you can be certain that Mollie was there helping me. Much of the time, she was sitting in my lap with her paws on the table in front of me. She did this when I was at the computer as well. Mollie loved water and could sometimes be found playing in it. More often she was looking for a drink from anywhere *except* the water bowl. 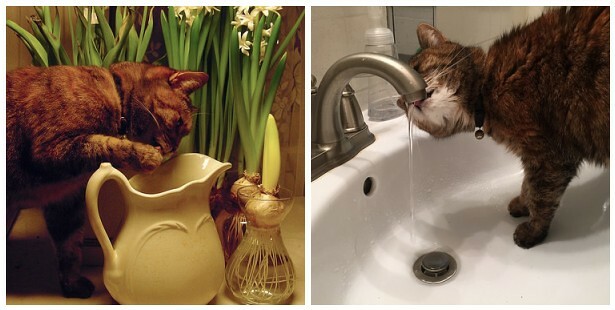 Running water was her favorite and she'd wake me in the middle of the night to turn the faucet on for her by knocking things into the sink or off the counter until I'd get up. Any cup of water left sitting out was fair game and if the water level was too far down for her to reach with her tongue, she'd dip her paw in and lick it off until she'd had her fill. 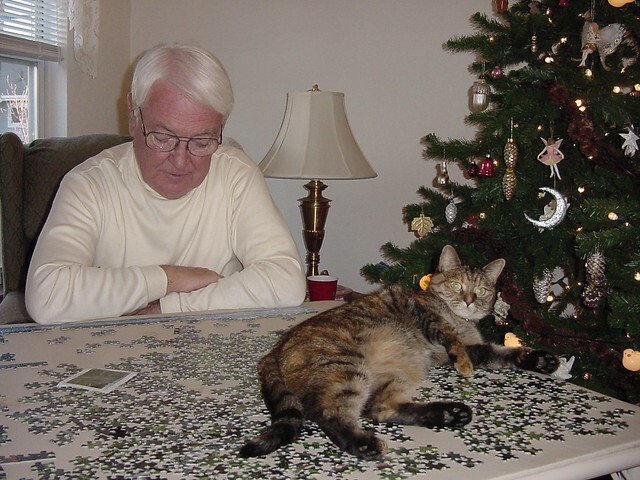 At holidays, we traditionally set up a jigsaw puzzle and she always had to participate! Here she is with my Dad about 10 years ago. 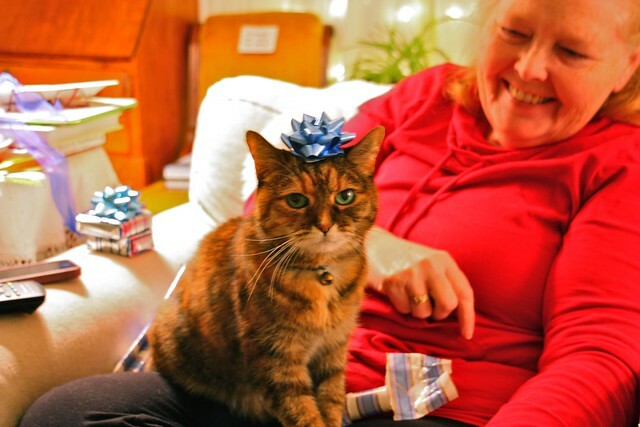 She even put up with our silliness at Christmas time, though I'm not sure how happy she was about that! Mollie was a terrific traveler! Her companion Thomas was NOT! Mollie happily would put on the harness and leash for walks and car travel. Thomas on the other hand got terribly car sick. Mollie would sit in front of his carrier to calm him down. Both kitties have been to many states. Mollie easily made herself at home wherever she was, so long as I was there with her. 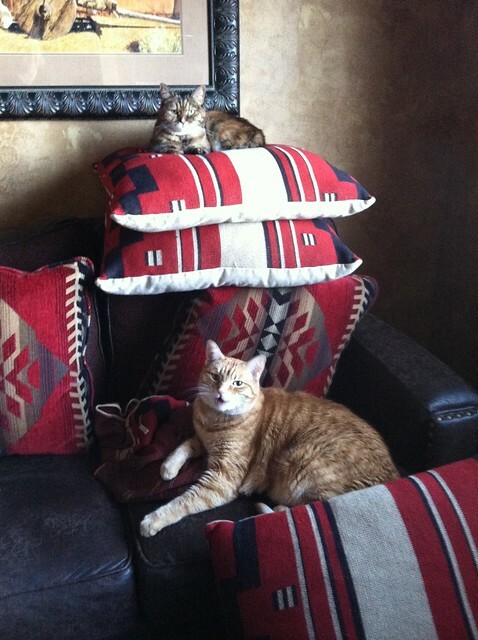 Here, they are in the motel in Santa Fe, NM. Mollie was about a year and half old when Thomas joined the family. Mollie was such a tough little cat, that we worried she would damage teeny Thomas who was barely 6 weeks old when he came to us. 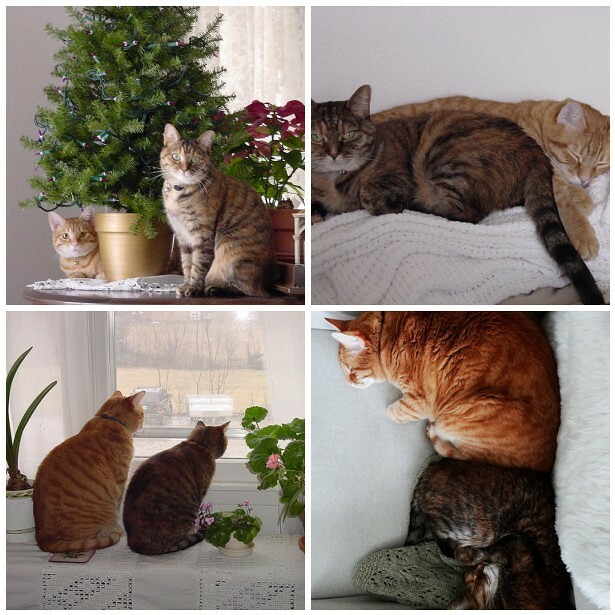 But they ended up wonderful companions even if they did take turns antagonizing one another from time to time. As you can see, tiny Thomas far outgrew little Mollie! Mollie weighed in at about 7 lbs at her peak weight, but was closer to 5 lbs most of her life. Thomas however was up to 24 lbs at his peak, but with a careful diet, now weighs in at about 19 lbs. 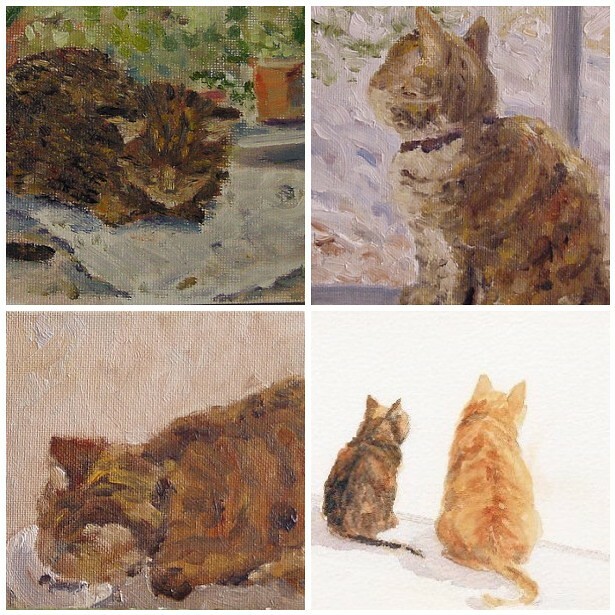 Mollie often made it into my paintings. 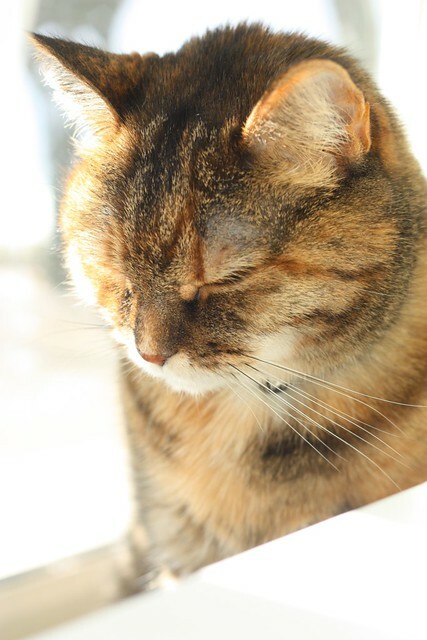 Mollie was my best friend; my constant companion; and the light of my life. I 'd like to think she felt the same way about me. With me, she was the sweetest kitty imaginable. When it came to other people though, Mollie only tolerated them, though she loved to be the center of attention in a room full of family. She was very particular about who could touch her or whose lap she would sit on. One veterinarian that we went to, told me after he nearly injected himself with her rabies vaccine, not to bring her back! She did not like him at all and was quite vicious towards him. All 5 lbs of her definitely got the better of a full grown man on that day! Thankfully, we found other veterinarians more willing to care for her and ones that Mollie liked better too! Mollie was pretty particular about who could sit in "her" chair. Those who didn't meet with her approval received a "tail beating". She would sit on the back of the chair, growl, and thwap her tail against whoever was in the chair that she didn't like. It was a pretty strong tail, so the person on the receiving end really felt it! My Mom in particular was a frequent recipient of such treatment, though in later years Mollie mellowed a bit and tolerated her better. It was so pointed an action that it really was rather funny to the rest of us watching! Mollie was my delight. The smartest kitty that I've ever had the privilege of knowing. There are so many stories I could share about her. 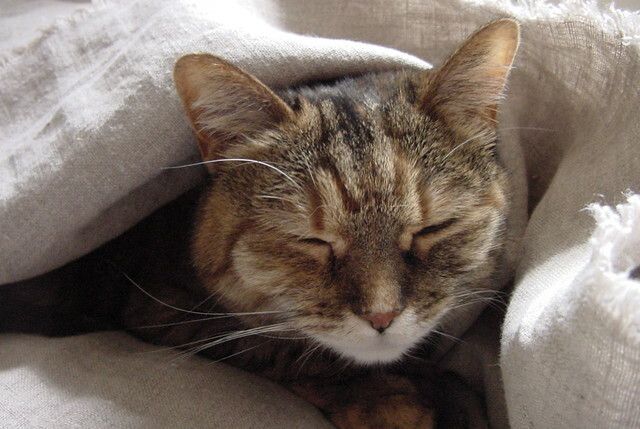 But mostly, what mattered, is that she has been the best kitty of my life. Oh Mollie Kitty... I am going to miss you so very much. Such a pretty girl. My sweet Mollie. How blessed you have made my life these past 16 years dear Mollie Kitter. How grateful I am for the gift that God gave me in you. I am heartbroken at having to say goodbye. I understand the great love you had for your friend. I always hate to read when someone loses a friend...I hate to say pet because our friends are so much more. Great memories of them never go away, and the longing to see them again never does either. I'm so very sorry to read this Lisa. I know all too well how it feels to lose a beloved pet/friend. I do, however, firmly believe, that you will see her again one day. What a wonderful, loving tribute to Molly. I am so very sorry for your heartbreak. Its amazing the bonds we create with certain animals such blessings. So sorry for the loss of Molly. I loved meeting her through all of her pictures. Thank you for sharing her with us. I'm so, so sorry that you lost such a special cat. They come along once in a lifetime, and people who've never known one don't fully understand the hole it leaves in your heart. 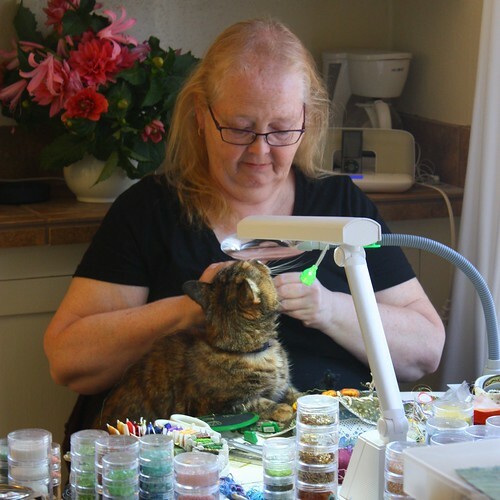 You gave her a wonderful life and a beautiful tribute post. Take care. My heart breaks for you, Lisa. Mollie certainly was beautiful and so photogenic. When I lost Boomer two years ago, I didn`t honestly know how I would cope without him. Like you and Mollie, Boomer and I were constant companions. He always sat in my lap when I was at the computer or when I stitched. He slept by my head every night and is buried out my bedroom window under the apricot tree, about 6 feet from me. The pain never goes away, just like the love we have for a parent or other close family member. And I believe that is how it should be. Love is love. So, the love of others (people and cats) does help, but never quite replaces that special relationship with That Special Feline. Hugs to you. I am so sorry to hear that Miss Mollie has crossed the Rainbow Bridge. 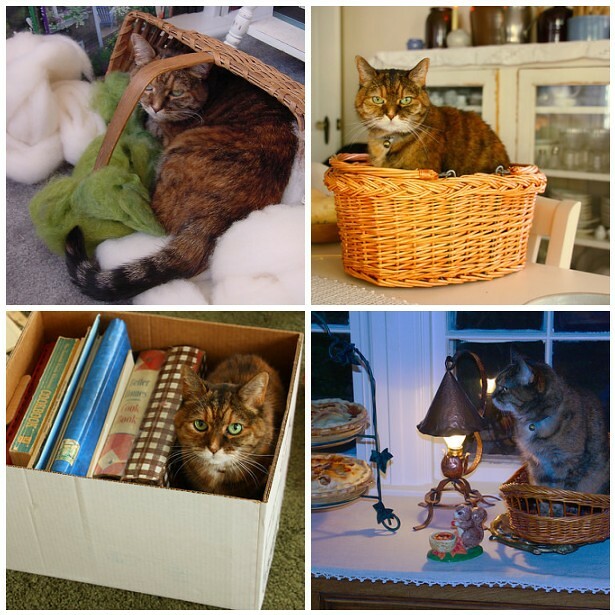 Saying goodbye to our beloved pets is so hard and leaves such an empty space. We are blessed, however, to have had the great pleasure of their company. They are indeed a gift from God. Dear, dear Lisa ~ My heart aches for your loss of sweet Miss Mollie. 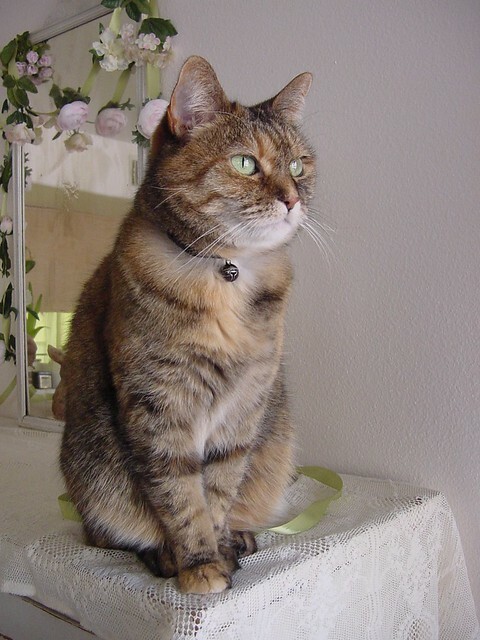 You wrote a lovely tribute and she was a beautiful cat. I love your paintings of her. I too, believe they are gifts from God. Lisa, Your stories of Mollie warm my heart! 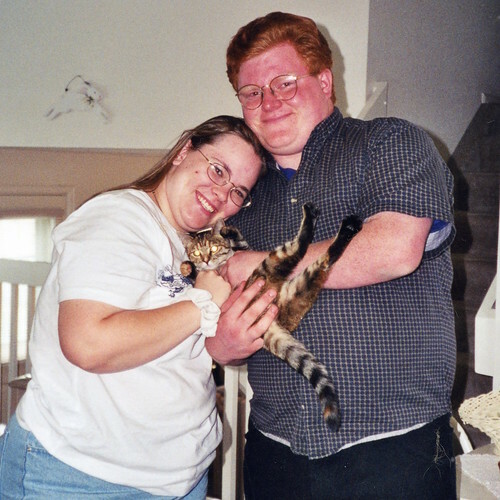 I have been a cat lover forever and have a cat that is now 15 1/2 and my constant companion. Yes they are persnickety little critters. Mollie sounds like she had a lot of personality in her 5 pounds! Her beautiful green eyes sure caught my attention. My hugs and thoughts and prayers are with you as you deal w/ the loss of your buddy! Lisa, I am so sorry for your loss. We had to have our sweet, goofy 13-yr old dog put down in May. The grief still overtakes me at the strangest times. The thing that has helped me and my husband is remembering this......it hurts so much, because God blessed us so much. Praying that, in time, you will learn to turn sadness over the loss of Mollie into praise for the One who gave her to you. If the gift was precious, then just imagine the Giver - He is so worthy of our praise. 16 years, so long and yet too short. What a beautiful little girl. I'm sorry for your loss. 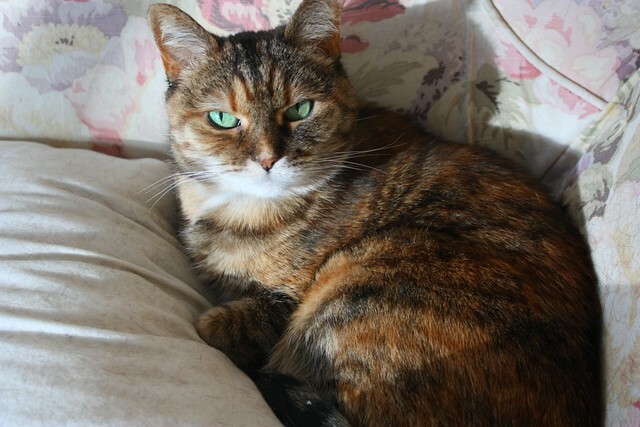 No other cat will ever replace her but I hope a little friend comes along who captivates your heart in a similar way. 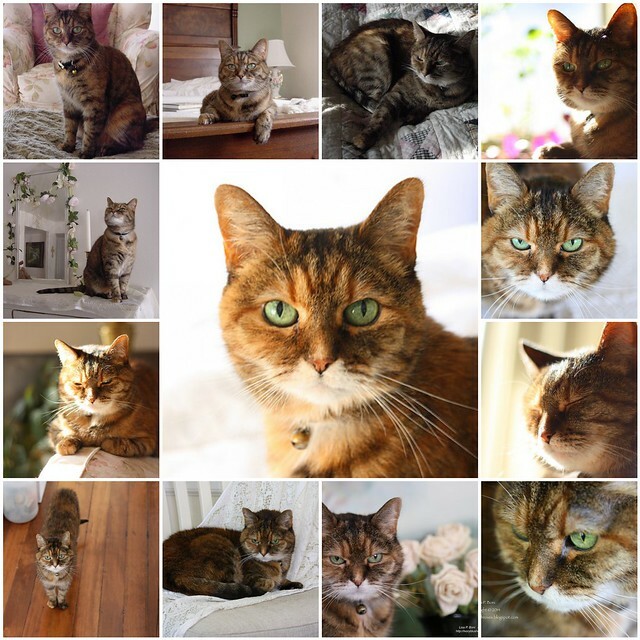 Such a heartfelt memorial to your darling, Miss Mollie Kitty. You shared so many funny and loving anecdotes I can almost see her. I'm so sorry for your loss. I had the some problem with my cat who was a part or our life during 18 years. Now Mollie is in the cat´s paradise. Blessing for you and your familly. It might help you to remember a quote from Winnie the Pooh. "If there ever comes a time when we can't be together, keep me in your heart, I'll stay there forever." It makes me smile when I think of the animals in my heart. Hope you start to feel better. I'm so sorry. What a wonderful blessing she was to your family and you to her. A beautiful tribute to your friend ....cats are such adorable and wonderful creatures! Their personalities are as unique as any human I know. I am so sorry for your loss.